L: Travel Organizer: 10". Top Compartment: 9.5". Bottom Compartment: 9.5". Small Pouch: 3.75"
W: Travel Organizer: 3.75". Top Compartment: 3.75". Bottom Compartment: 3.75". Small Pouch: 3"
H: Travel Organizer: 6.5". Top Compartment: 4.5". Bottom Compartment: 2". 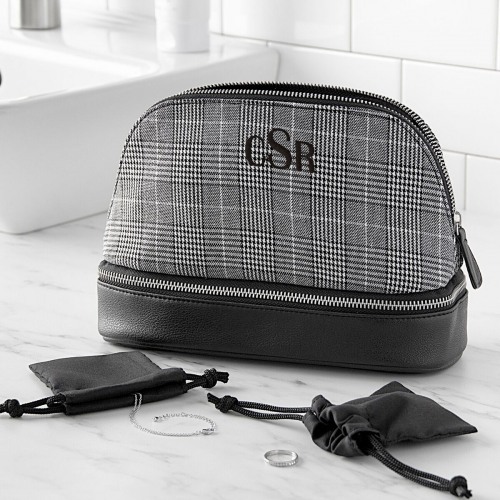 The Personalized Glen Plaid Travel Organizer is perfect for traveling and features an elegant plaid pattern. With a black vegan leather bottom compartment and secured with a zippered closure. The bag is equiped with two small jewelry pouches for all your essentials. This stylish chic bag makes traveling easy.